PITTSBURGH—Youth football is safer than it has ever been due to innovations in safety equipment and nationally mandated health certification programs, argues University of Pittsburgh Clinical Professor of Neurological Surgery Joseph C. Maroon. Brain-trauma education advocate Chris Nowinski counters that the inherent risk of head injuries to the still developing brains of children makes full-contact football an unsafe sport for minors. 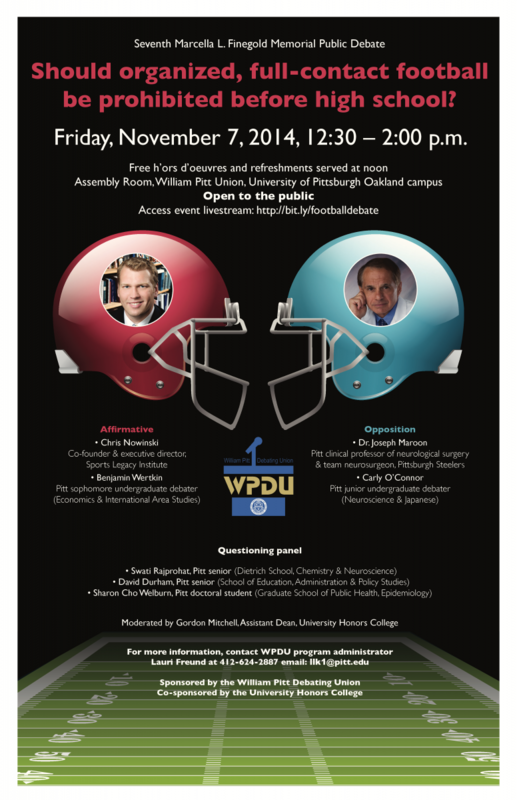 Maroon and Nowinski will join Pitt students in debating the question, “Should Organized, Full-contact Football be Prohibited Before High School?” during Pitt’s Marcella L. Finegold Memorial Public Debate. The free, public debate is occurring as the filming in Pittsburgh of Will Smith’s latest film—tentatively titled “Concussion”—is bringing the national conversation on football’s relationship to concussions and other brain trauma injuries to Southwestern Pennsylvania. The event—the seventh in the Marcella L. Finegold Memorial Public Debate Series—will be held at 12:30 p.m. Nov. 7 in the Assembly Room of the William Pitt Union, 3959 Fifth Ave., Oakland. Audience members will be invited to use response buttons that will record attendees’ opinions on the topic prior to the debate as well as gauge the level of shifting opinions during the event. The debate also will be accessible through a live webstream and viewers can submit questions for the debaters via Twitter using the #FootballBanDebate hashtag. Maroon, team neurosurgeon for the Pittsburgh Steelers and a clinical professor and Heindl Scholar in Neuroscience in the Department of Neurological Surgery within Pitt’s School of Medicine, will be arguing on the opposition side of the question. Maroon will be joined by Pitt undergraduate debater Carly O’Connor. Nowinski, founder and executive director of the Sports Legacy Institute, a nonprofit organization dedicated to researching the long-term effects of concussions and other brain traumas and educating the public on such injuries, will be arguing on the affirmative side of the question. Nowinski will be joined by Pitt undergraduate debater Benjamin Wertkin. Following oral arguments, debaters will field questions from a panel composed of students in Pitt’s Graduate School of Public Health, School of Education, and the Departments of Chemistry and Neuroscience within the Kenneth P. Dietrich School of Arts and Sciences. More than 100 students from Allegheny County high schools will attend the event as part of coursework for the Arguments Course in Pitt’s College in High School Program. The series of debates are made possible through a generous gift from Pitt alumnus Marcella L. Finegold, who graduated from Pitt’s College of Arts and Sciences, now the Dietrich School, in 1937. The debate is sponsored by the William Pitt Debating Union and the University Honors College. For more information, contact Lauri Freund at llk1@pitt.edu or 412-624-2887.